One of the most confusing topics in retirement planning is understanding the basics of Social Security. I will admit that Social Security can be extremely technical, confusing and downright boring, and with the future of Social Security uncertain, many people are hesitant to put in the time and brain cells required to understanding how the program works. Putting political views aside, Social Security is likely here to stay. Although benefits may be different for younger generations, it will continue to be a significant source of retirement income for many households. So it is important! Putting excitement level aside, it is essential to understand the basics and how the benefit fits into your overall financial plan. 1. 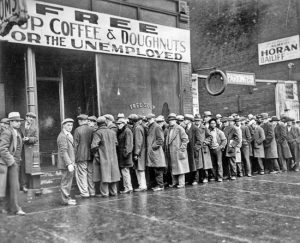 Social Security was created after the Great Depression as a social safety net to provide funds for older Americans who are no longer working. The 1935 Act provided for retirement benefits, benefits to dependent children, disability, and unemployment insurance. Keep in mind that around this time, individuals who reach the age of 65 could expect to live, on average of only another 12 years! 2. The majority of American workers do or will receive Social Security benefits based on their work record or the record of an eligible spouse. About 97% of Americans have or will receive benefits. 3. Over time, Social Security has shifted from serving as a supplemental retirement program to a significant source of retirement income for many households. In 2018, Social Security provides over 50% of retirement income for almost half of married older couples and 69% of older unmarried individuals. The average monthly Social Security benefit is about $1,413 per month or $17,000 a year and replaces less than 40% of past earnings for the average beneficiary. 4. Your social security benefit is based on your work record. To be eligible to receive Social Security benefits, you must have 40 quarters—or 10 years– of work-related income credits. The amount of earnings it takes to earn a credit may change each year. In 2018, you must earn $1,320 in covered earnings to get one Social Security work credit and $5,280 to get the maximum four credits for the year (SSA.gov). Your benefit is calculated based on the highest 35 years of wages, factoring in the present value of the average and a benefits formula to establish your primary insurance amount. 5. You are eligible to receive 100% of your Primary Insurance Amount if you wait to file at your Full Retirement Age which is based on your year of birth. The earliest most people can file is age 62 which would reduce your permanent benefit by almost 30%; and if you wait to file after your Full Retirement Age, your benefit will increase by 8% every year that you do not file until age 70. So it pays to wait! 6. If you file early and continue working, some of your benefits may be held back subject to an earnings test. If you earn more than $17,040 in 2018 and you file for benefits before your FRA, $1 of benefits will be held back for every $2 of earnings above that earnings threshold. In the year that you reach FRA, for every $3 you earn above $45,360, $1 of benefits will be held back. The benefits held back will then be added to your benefit once you reach FRA. So individuals who are still working in their early 60’s may want to wait to file for benefits until they fully retire from work. Note that if an individual reaches FRA and continues to work, the earnings test does not apply. What you might not know about Social Security but really should! 7. The break-even age for filing is not as far away as many people believe. 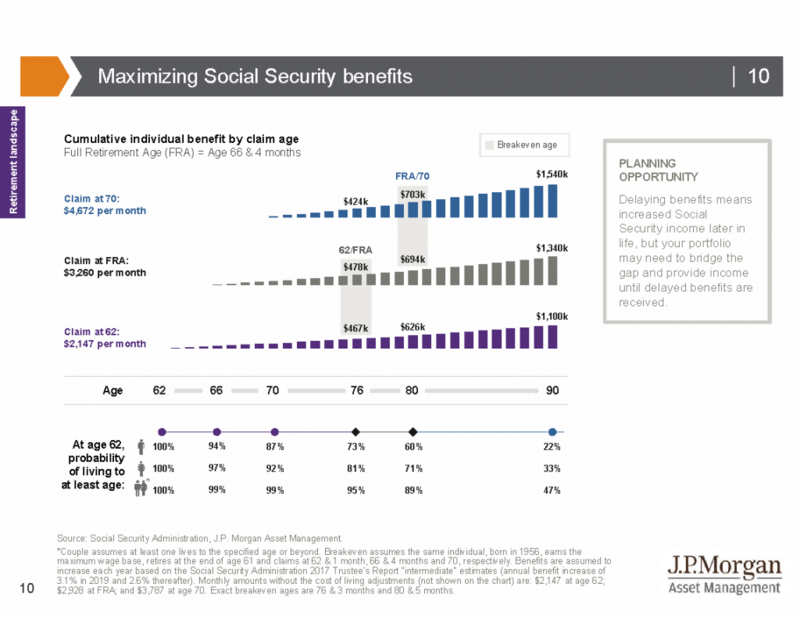 JP Morgan research (illustrated in the chart below) estimates that the break-even age for an individual who turns 62 in 2018 and files in 2018 (in purple), and an individual who turns 62 in 2018 but files at his/her FRA at age 66 and 4 months (in gray) is age 76. In other words, both claimants will have received about the same amount of benefits by the time they reach age 76 even though they claimed at different ages; but over time, the person who waited until FRA to file will receive more benefits overall. 8. Social Security benefits may be taxable. If you are receiving benefits and your “combined” income (combined income is defined as all income including tax-exempt income plus half of annual Social Security benefit) is $25,000-34,000 for single filers and $32,000-44,000 for joint filers, up to 50% of your Social Security benefit may be included in taxable income. If your combined income is more than $34,000 for single filers/$44,000 for joint filers, up to 85% of your benefit is taxable. The includable amount will be taxed at your current tax rate. 9. The Social Security Administration only sends out Social Security statements to individuals age 60 and over who have not yet begun receiving benefits. Individuals who wish to receive an estimated benefit amount may create an account and receive an estimate. The SSA.gov website also provides Social Security benefits calculators as well as information on spousal and other benefits.